Breaking The Cycles: Day 6- Eureka to Ely- Winds were not in our favor! 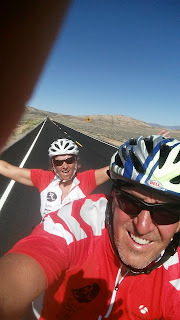 Day 6- Eureka to Ely- Winds were not in our favor! Holy cow!! The winds blew against us all day. Took every ounce of strength to get to Ely. At least it wasn't as hot. The rain started as soon as we got to Ely. We climbed 4 mountain passes today as well. A total of 4400 ft of gain. Man our legs are sore!! When we got to Ely, I met a man at the park. He was eating by himself and was up for conversation. Baron and I started talking to him and he is actually from Grants Pass, Oregon! What a small world. He moved here 12 years ago. His dentist gave him a great bike with a super fat seat. He even offered to give me his seat! Most people we have met love to visit and have someone pay attention to them. Today's ride was probably our hardest. It is day 6 of long miles- but the head wind and climbs were the tiring part. Plus with the wind, we couldn't hear the music or ourselves. One thought came to mind. Jim Carey gave a commencement speech in 2014- His quote is "It's better to fail at what you love than to fail at what you don't". Several of the people I have met in the last year at Switchpoint made me think of this today. Some just needed a little support and guidance to try what they always wanted to. Andrea always wanted to be a hairdresser. She has 2 small children and things have been very tough. After she joined our Circles group, she made a goal to apply for Cosmetology school. She was accepted and is in her 2 month. Fear is what kept her from doing what she wanted to do. There are two emotions that drive each of us- fear and love! Do what you love to do! Even if you fear it. His dentist donated him a bike so he let me try it out! I love recognizing the hero's in my life and the three of you are definitely at the top!!! I know there will be many hard days in this Coast to Coast bike ride to raise awareness for our friends that struggle with poverty and homelessness, but YOU ARE MAKING A DIFFERENCE!! sending out messages to shelters that there is much more to do to change the "cycle". as we all say, AWESOME!